AirAsia officiated the recently launched route from Davao to Kuala Lumpur, Malaysia. The route now operates four times weekly flights between Davao and Kuala Lumpur. Route DVO - KUL departs at 2:55pm and arrive KL at 6:45pm every Monday, Tuesday, Thursday, Saturday while KUL - DVO departs at 10:25am and arrives 2:25pm on the same days. To officiate the Davao - Kuala Lumpur route, a press conference was held last February 1, 2018 attended by Davao City Mayor Sara Duterte- Carpio, Tourism Assistant Secretary - Eden Josephine David, AirAsia Deputy Group CEO - Digital, Transformation, Corporate Services- Aireen Omar, AirAsia Berhad CEO - Riad Asmat. 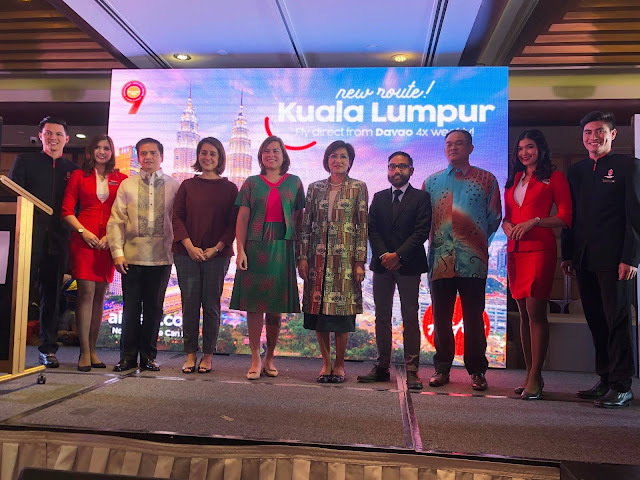 AirAsia Deputy Group CEO - Digital, Transformation, Corporate Services- Aireen Omar said, "AirAsia is excited about our first international route to davao. We do not only connect Davao to Malaysia, but we also bring Davao closer to our extensive network of destinations in Asean, Northeast Asia, South Asia, Australasia, the Middle East and the US". To celebrate the new route, al-in-fares from PHP1599* one-way are available for booking online at airasia.com until February 18, 2018 for the travel period between now and July 2018. The promotional fare is also available to AirAsia's mobile app, as well as the mobile site at mobile.airasia.com. See more photos of the officiating event below.